"Fifty Year History of Feltonville United Methodist Church 1923-1973"
The Feltonville United Methodist Church is a beautifully styled brick building subtly blending the lines of older architecture with a soft intrusion of modern styling. Its setting retains a somewhat rural atmosphere amidst the definitely urban surroundings. It seems ageless yet it is not new. In November, 1973 it will celebrate its fiftieth anniversary. The idea of a Feltonville Methodist Church was first conceived in the fall of 1922 by a pastor of Parkside Methodist Church, Dr. Paul D. Eddy. He had learned that a number of hymnals and Bibles were stored in the old Franklin School and he wanted to use them to establish a place of worship. Although previous efforts to found such a church had failed, he worked tirelessly to make his "dream" a reality. The first Feltonville church lacked physical assets. It did not, however, lack a dedicated and devoted founding group of supporters. The first services were not even held in a church building but in the old Franklin School, now the home of Mr. and Mrs. Donald Bullock. The activities were publicized by Mrs. Isabelle Wolfe, who walked many miles to advertise the time of the services. On the first Sunday an attendance of approximately twenty-five worshippers attested to the fact that the Feltonville Methodist Church had, indeed, been established. By April, 1923, the first ten persons were received into membership. Two of these members, Mrs. Clara Barrowclough and Mr. Milton Marriner, will attend the Fiftieth Anniversary Service. Besides being the first president of the Ladies Aid, now the Women's Society for Christian Service, Mrs. Barrowclough taught in the church school from its inception until October, 1967. She celebrated her 95th birthday in August of 1973. Mr. Marriner, the first church secretary, has served in numerous positions up to the current time. Another early member, Mrs. Martha Talbot, will also attend the Anniversary Service. She has served as a Sunday School Superintendent and teacher as well as having been President of the Women's Society. Although the services in the old Franklin School actually established the Feltonville Methodist Church, its founders immediately directed their efforts towards obtaining land for the construction of a church building. The first Official Board Minutes refer to "... locating a piece of ground suitable for a building lot..." The lot was obtained in late 1924, donated by Mrs. Harriet Peters. Through the devoted efforts of an energetic Official Board and an active Building Committee composed of Mr. Marriner, Mr. Theodore Black, Mr. H. Barrowclough, Mrs. Clara Barrowclough, Mrs. Ida Green and Mr. John Holcroft, excavation was started an on May 17, 1925 the cornerstone of the new church was laid. Although the church was reported as its dedication in 1926 to be valued at about $20,000, the real value could not be appraised in dollars. The path from concept to culmination had not been a smooth one but the dedicated group directing and contributing to the activities didn't expect it to be. Their determination and persistent efforts saw to it that the edifice was completed. On February 14, 1926 for the first time, the "Minutes" stated that "The Official Board of the Feltonville M. E. Church met at the church at 4 P.M." instead of at the schoolhouse as recorded in previous minutes. Besides the work of the early pastors, Board members, and the congregation, there were many other contributions. Bricks were donated by Major General William G. Price of Chester. Two thousand dollars was donated by the Philadelphia City Mission and Church Extension Services, the pulpit furniture and the communion table were given by friends of Mrs. Charles A. Benjamin, the pastor's wife, and the large pulpit Bible was presented by John B. Stark of Chester. There was also a piano presented by Mrs. Clara B. Taylor of Chester, hymnals donated by the Philadelphia Conference Tract Society of the Methodist Episcopal Church and alms basins, a gift from the children of General and Mrs. Smedley D. Butler. Although the congregation was intent on worshipping the Lord, there were still those who also continued to work diligently to add to the beauty of the worship service. The piano which had served as the source of music was supplemented with a new spinet model Hammond organ. This instrument, purchased in May, 1952, still serves the congregation today under the able skill of the organist, Ernest Fisher, Jr. The Church congregation and Sunday School continued to grow and as the years passed, the capacity of the church pews became inadequate. At the Christmas and Easter services, church officials were always hurriedly placing chairs in the aisles and on numerous occasions came close to having some worshippers stand during the entire service. Again, an active building committee was formed and in 1960, under the driving force of its pastor, Dr. Robert B. Clark, the congregation extended the sanctuary and the Sunday School rooms sufficiently to double their capacity. Once again, the membership and friends of the church joined to provide the larger facilities. Subscriptions for installment contributions of money were obtained from the members, building materials were donated by local merchants, memorial pews were purchased by individual members, altar rails with communion leaves and choir pews were gifts from the Parncutt sisters. Aisle and altar carpeting was donated by a woman not even associated with Feltonville. The men of the church laid timbers and flooring. The women undertook project after project to provide necessary material and funds for the church extension. In 1961, the job was complete. The Feltonville Methodist Church had doubled in size and the large lighted wooden cross, a memorial gift from Mr. Milton Marriner, seemed to become a monument to those at Feltonville who had served the Lord. Today, as the Feltonville United Methodist Church celebrates its fiftieth anniversary, other changes can be noted. One of the huge oak trees that formerly graced its lawn no longer exists. A public address system, installed in memory of one of its previous ministers, the late Rev. Salkeld, assures the congregation of hearing the services. The sanctuary has been air conditioned, a memorial gift from Mrs. Lucy Yanks. But no matter what changes are noted, there are certain things that never seem to change. There is still a dedicated, concerned group directing the activities of the church. The pastor still has the dream of better things to come and works tirelessly to achieve them. The youth group contributes a significant share of the effort necessary to maintain and improve the church, and the congregation is still as warm and friendly a group of people as can be found anywhere. Feltonville United Methodist Church is fifty years old - but its continual rebirth keeps it always young in His service. 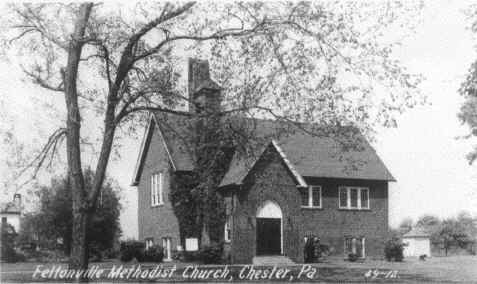 Feltonville Community Methodist Episcopal Church was dedicated March 21, 1926 at the corner of Felton Ave. and Chichester Rd., Feltonville. Due to declining membership, the last formal service was held on June 25, 2000 but a final Celebration Service was held on Sunday September 17, 2000. Recollections: "One of the most memorable and beautiful things belonging to God and his church is the Old Oak tree on the front lawn. I think that you would agree with me that it is still splendid and very old. Many events transpired on this lawn over the years such as the Strawberry Festival held every June in the 1940's & 50's. The tree has a special place in the hearts of those who attended this church. "July brought the Sunday School Picnic, which was held at Lenape Park (now called Main Line Park) it also was a very old park. "During Christmas the Choir members would go caroling throughout the community, and on Christmas Sunday the children would recite verses about the birth of Christ. "The WSCS (Women's Society of Christian Service) would sponsor various activities during the year such as the Calendar Party in the basement of the church. Twelve tables would be set depicting events for each month such as Easter, Christmas, Independence Day, etc. Food would be served. There was also entertainment. "There was a Boy Scout troop in the 20's & 30's and maybe later also. I have proof of this as I inherited my uncle's scout uniform. His name was Norman (Kelly) Marriner. He was killed in action during WWII at the young age of 19."